The RIVA/Solas Race Pump & Nozzle delivers increased acceleration & top speed along with reduced cavitation. Designed for high performance applications that exceed the limits of original pump efficiency. Features computer designed 159mm/14-vein stator section that is far more efficient than the stock 10 vein pump. Vein housing is constructed of high-grade stainless steel for superior strength and corrosion resistance. 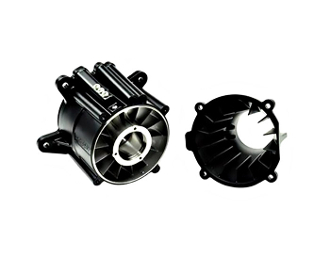 Utilizes standard pump impellers, OEM bearings, seals and drive shaft. Includes matched 14-vein nozzle with 84mm exit. Pump features a RIVA 159mm Stainless Wear Ring (part# RS33-159-SRX) for increased durability and performance. Fits most 260, 255 & 215hp iControl models.